Today I wanted to sit down and write a post all about some of my favourite products that I am using at the minute. 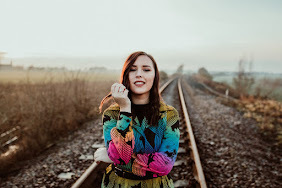 These products aren't the typical skincare products for the face that I usually discuss on this blog, but products that some people often forget about or don't tend to talk about as much. I will be running through my favourite products to help look after your hands, lips, feet and more. I will be telling you why I love using them and hopefully giving some of you some recommendations to try out yourself. 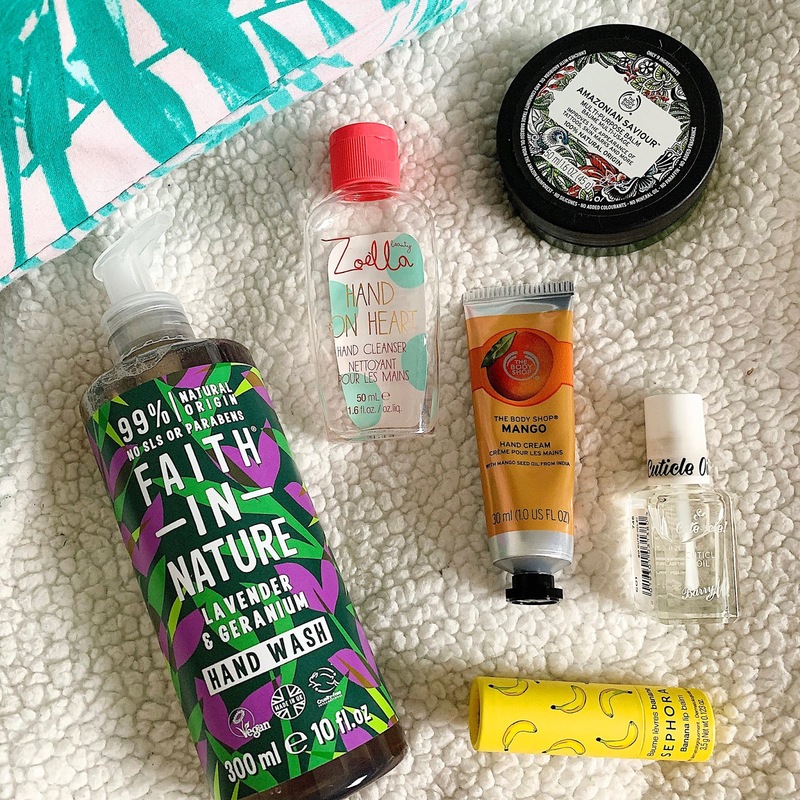 As always, everything featured in today's post is 100% cruelty free! This hand cream is one that I have used for as long as I can remember. Soap and Glory is always a go to brand for me and one that I know is always good quality. This hand cream has been one that I have used for years and years because I know it works! This product smells amazing and leaves my hands feeling super soft. It doesn't leave a greasy feeling on your hands and helps to keep the hands hydrated. I always apply hand cream on a morning and a couple of times throughout the day. It's a really important step to remember and also looks after your nails too. Soap and Glory is an affordable brand that always does the trick. Most of you will already know how much I love The Body Shop. I went to a Body Shop event a while back now and decided to try out one of their hand creams after hearing so many people talking about it. Now this is a product that is always in my handbag and with the rest of my holy grail products. I always feel like I need to have one of these on me at all times! At the minute I am loving using the Mango scent as this smells like a dream! I really love the size of these products as they are easy to take anywhere with you and perfect for on the go! This product and the Soap and Glory one are the only two hand creams that I use and I can't live without them! There are a variety of other different scents of this hand cream so it's defiantly worth having a look and testing it out for yourself. Another hand product which I had to include in this post is the Hand Sanitiser that I currently use. The Zoella Hand on Heart Hand Cleanser is something that I have now used for months and months and I don't think I'll be switching to a new one anytime soon. I didn't think I was picky when it came to hand sanitisers but it turns out I am! This one has won me over as it sinks into the skin really quickly and doesn't have that really strong clean smell that most hand sanitisers do. It comes in a 50ml packaging so it tends to last me a while! I am on my third bottle of this and ready to order another one as we speak! I love having this on the go and it's a product that I use everyday. Although it's not the most glamorous beauty product to discuss...it's one that needed including in this post! Next we have a product which is new to my skincare routine over the past couple of months or so. I started to get my nails done sometime last year and now I get them done every 3 weeks. It's something that I wish I had started earlier as I love having nice nails all the time! The lady who does my nails explained to me how important it is to use a cuticle oil to help look after my nails and make the colour last on them as long as possible. Cuticle oil is honestly something I have never thought about before and looking after my cuticles never really crossed my mind. But now I love to apply cuticle oil every few days or every day if I remember to help look after my nails as much as I can. I use the Barry M Cuticle Oil as this was one of the cruelty free options on Superdrug and it works wonders! It doesn't feel greasy after applying this onto the nails and it's helping to keep them as healthy as possible! The final product that I wanted to mention in the hands section of this blog post was a hand wash! I have been loving using the Faith in Nature Lavender & Geranium hand wash recently. I was kindly sent this by the brand to test out and I am really loving using this on a daily basis. Again, hand wash was something I never thought I was that picky about and would use various ones, but after using this product on a regular basis I feel like I need to use this one all the time! It smells like a luxurious spa product and leaves my hands feeling super soft. I think using an amazing hand wash really does help to keep your hands feeling hydrated and soft on a day to day basis! If you read my blog often you will know already that I love this brand...but if you haven't tried it out yet...please do! There is only one product that fits into this category for me as it's the only foot product that I have every really used and loved. 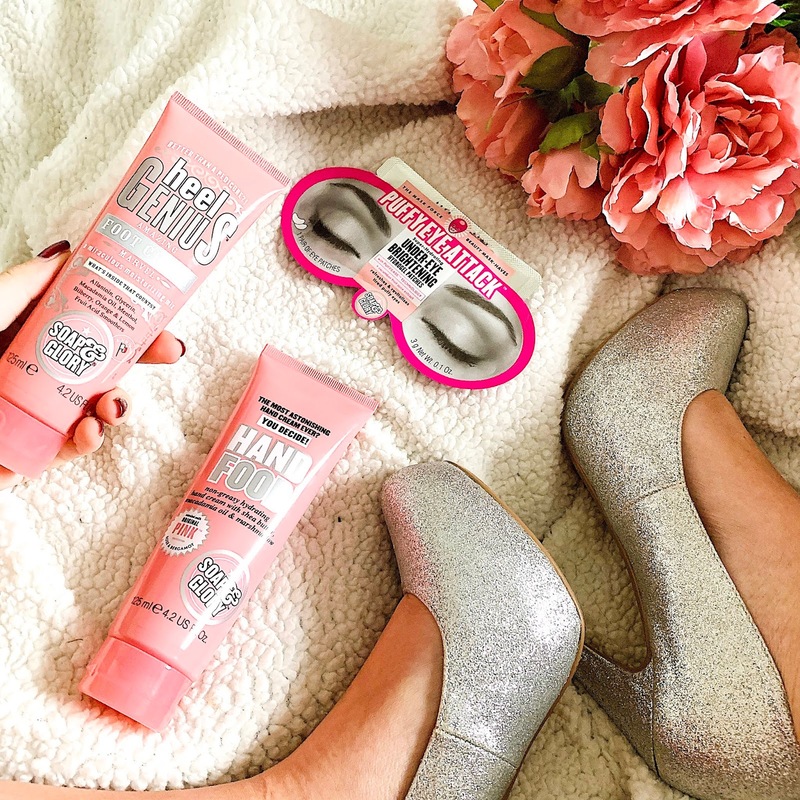 The Soap and Glory Heel Genius is also a product that I have used for as long as I remember. If I'm honest, feet are the one thing that I often forget about when it comes to looking after your skin. It is definitely the part that get's the least attention from me! I'm not a huge fan of feet so this could have something to do with it! You apply this product all over your feet before you go to sleep and once applied, you wear some cotton socks while you sleep. You can get these socks from pretty much anywhere, I usually get mine from Wilkos. I try and do this at least once a week to keep my feet hydrated and soft. It is really important to look after your feet as you are usually stood on them most of the day and they will often need a bit of care and attention. This is the only product I use to keep my feet healthy and I wouldn't recommend any other product as this one works wonders! Now I think that this product will be one that people love or hate. Not the product itself but the choice of scent that I chose to buy. I bought this Sephora Banana lip balm last summer in Corfu. I decided to go for this scent as it smelt pretty amazing and I am so happy that I chose this one as I now love it! This is the first Sephora lip balm that I have tried and I already know that I need to buy some more of them. I have used quite a few different lip balms as I never have really had a preference, but I am currently obsessed with this product and it works really well for me. I often struggle with dry and cracked lips and this product always works well to help this. The product isn't too thick and will leave your lips feeling super soft. I really love the packaging for this product too! The UK really need to up their game and get a Sephora as I need to buy more of these lip balms! I just wanted to mention one product that I have been using recently to look after my eyes. Over the past couple of months I have really started to take care of the skin around my eyes a lot better instead of just including it as part of my whole face routine. I know that the skin around your eyes is a lot more sensitive and needs to be taken care of that little bit more. It's important that you are gentle with this part of your face and it's also often the part of my face where you can see if I'm tired or not so I find it really useful to make sure my eyes stay healthy and hydrated. 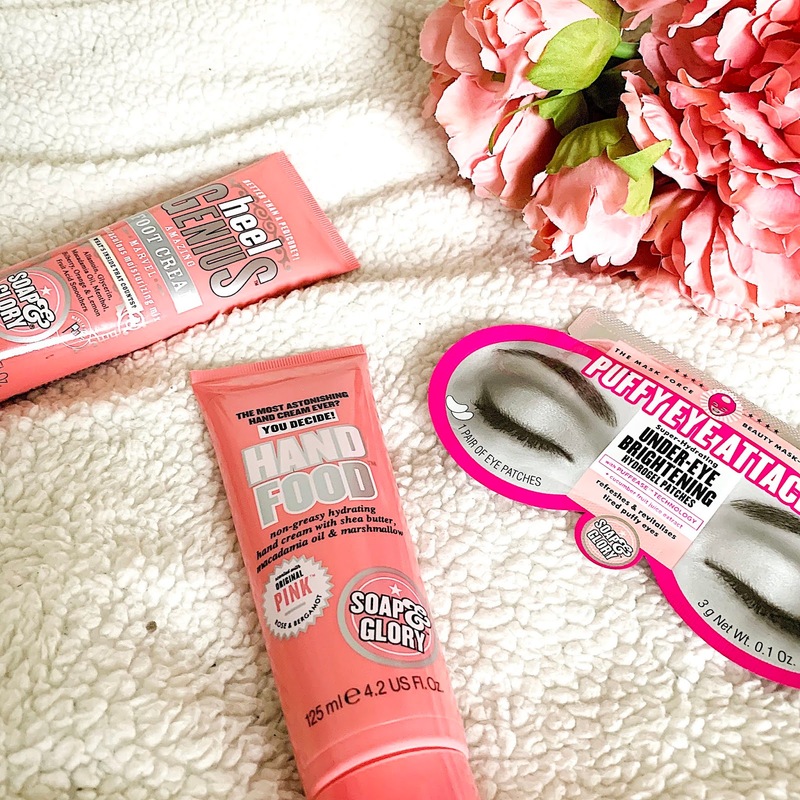 I have been using the Soap and Glory Puffy Eye Attack Under-Eye Brightening Hydrogel Patched...wow that's a mouthful! These are small gel pads which you place under your eyes for 20-30 minutes to refresh and hydrate your eyes. This is a product that I love to use on a Sunday to repair any damage from the week and prepare myself for the new week coming. I would 100% recommend this product if you're looking for something to help take care of your eyes or something for the perfect pamper day. The final product I wanted to include is one that some of you may not think is relevant to you, but this product has quite a few purposes. This Saviour Balm from the Body Shop is one that I love to use to keep my tattoos looking fresh and healthy. I have seen so many people talk about this product as it's a popular one for tattoo care in the Blogging world. I try and apply this a few times a week to my tattoos to make sure they are looking their best! I feel like it always keeps them looking new and takes care of them as much as I can. I always recommend this product to anyone who asks me about my tattoo experience and how I keep up with looking after them. Although this product is well known for the care of tattoos, it can also be used to help areas of dry skin and skin marks as well. I have used this a few times on small dry patches of skin and it helps to clear them up instantly. I haven't personally tried this product out on skin marks yet but I would trust that this does the trick for this too! I really love this product as it has so many uses!